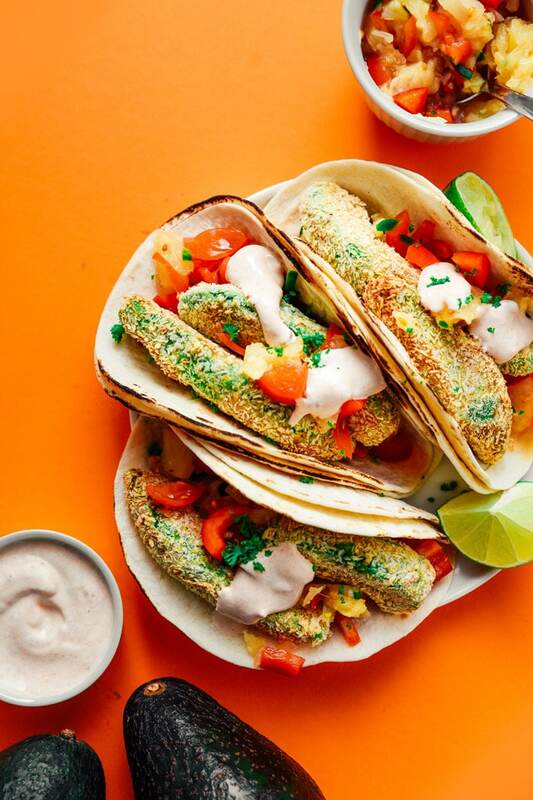 Creamy, crispy avocado tacos with fresh pineapple salsa and a creamy chipotle sauce, perfect for your vegetarian Taco Tuesdays! 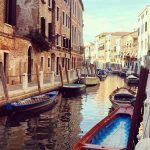 This recipe has been updated to be more concise, easy to follow, and delicious! I used to think that tacos weren’t all that easy to make vegetarian. 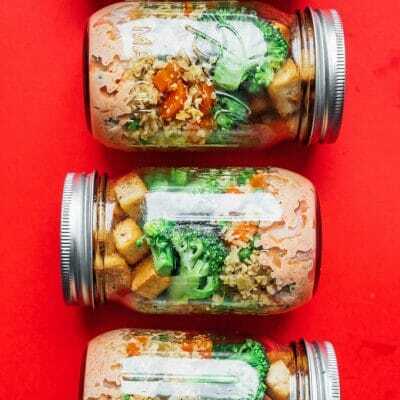 Chickpeas are better suited for gyros and tofu tends to scare off the meat eaters with whom you may share a dinner table. But when I came across Minimalist Baker’s vegan avocado tacos, I knew there was hope for the vegetarian taco. So today we’re nixing the faux-meats and throwing in some crispy avocados! I used to always bake my avocados, but after recently getting an air fryer I’ve changed my ways! Air frying your avocados makes them so much crispier, while cooking them a lot faster. But feel free to use either method for these avocado tacos! 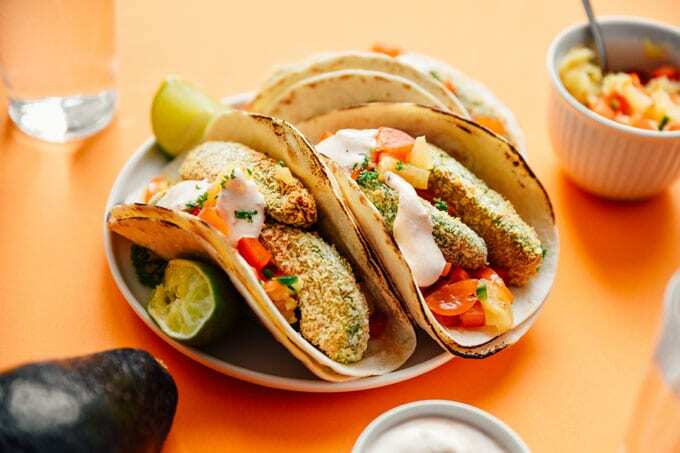 Avocados: Breaded with panko then either baked or air fried into crispy perfection. Pineapple Salsa: We’ll make a quick pineapple salsa, but feel free to sub your favorite store bought salsa! Creamy Chipotle Sauce: A simple combo of yogurt, mayo, and adobo sauce (from a jar of chipotle peppers). This stuff is always a hit at taco nights! It looks complicated, but I promise it’s simple. Throw pineapple, tomato, some peppers, and spices into a food processor and blitz. Salsa, done. 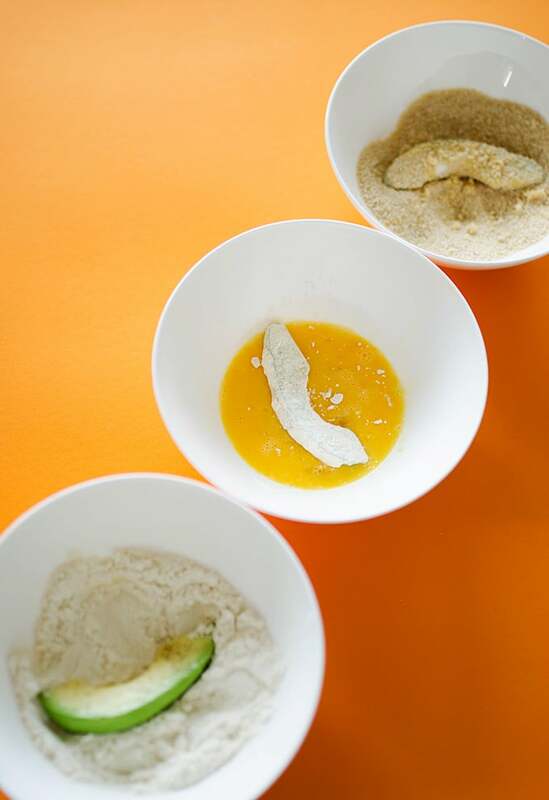 Then we’ll coat our avocado slices with a traditional flour – egg – panko combo and either bake or air fry them. Finally, whip together a tangy, creamy chipotle sauce. Toss it all onto a flour tortilla (or hard shell if that’s your style), fold in half, enter taco heaven. Salsa: Combine all Salsa ingredients (finely chop by hand or blitz in the food processor), cover, and set in fridge. 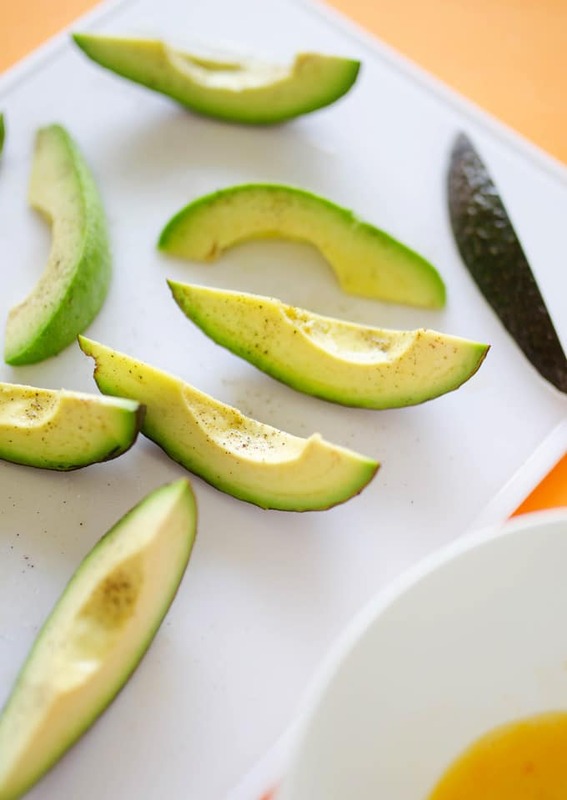 Prep Avocado: Cut avocado in half lengthwise and remove pit. Place avocado skin side down and cut each half into 4 equal sized pieces, then gently peel the skin off of each. Prep Station: Preheat oven to 450 F (230 C) or air fryer to 375 F (190 C). Arrange your workspace so you have a bowl of flour, a bowl of whisked egg, a bowl of panko with S&P mixed in, and a parchment-lined baking sheet at the end. Coat: Dip each avocado slice first in the flour, then egg, then panko. Place on the prepared baking sheet and either bake or air fry for 10 minutes, flipping halfway through cooking, until lightly browned. 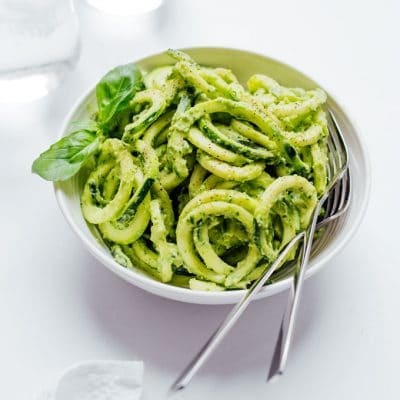 Sauce: While avocados are cooking, combine all Sauce ingredients. Serve: Spoon salsa onto a tortilla, top with 2 pieces of avocado, and drizzle with sauce. Serve immediately and enjoy! 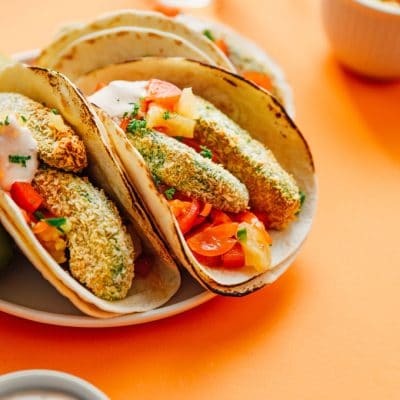 Inspired by Minimalist Baker’s Panko Baked Avocado Tacos. A photo from when I originally published this recipe! 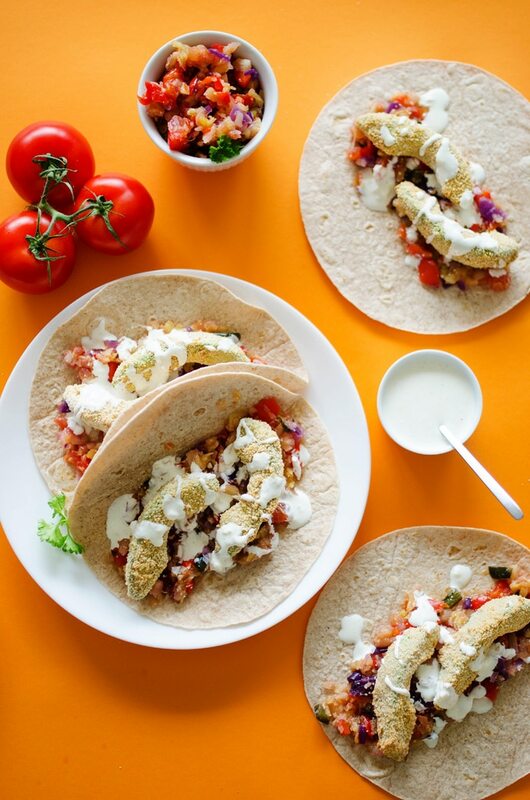 Addicted to tacos – this is definitely going to be a must try this week for dinner! Thanks for sharing. Me too! Didn’t realize how addicted I am until I had them again for the first time in months. Hubba hubba. Happy cooking to you! I love tacos. I can eat them any day. Thanks for the recipe. These look delicious! I never thought to bread avocados, but it’s a great idea! Looking forward to trying them! These look delicious!! I am a huge avocado fan! 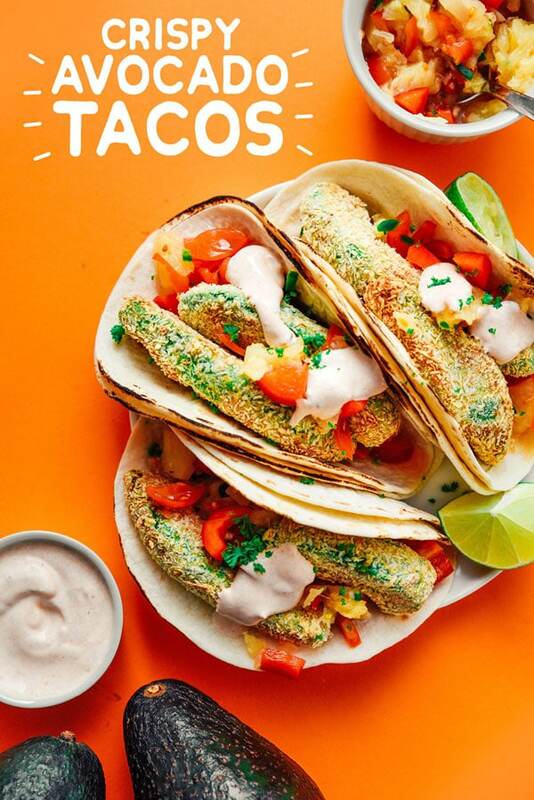 I thought I had tried every taco recipe out there but I love this new twist! yum! These look incredibleeee!!! I’ve never baked avocados before!! I cannot wait to try this! Thanks so much, Kristen! The texture of the avocado itself doesn’t change much but the outside gets nice and crispy and the result it SO addictive. I could eat an avocado everyday (I practically do! ), but I’ve never had them like this before. Sounds great! WHAAAT?! I didn’t think I could love avocado more than I do now, but I think this just might do it. SO GOOD! This looks amazing!!! I love avocado! Oh wow, I have never thought about making a baked avocado before – I think I’ve been missing out! Ive never thought about baking avocado but this looks delicious! Cant wait to try. Yum! 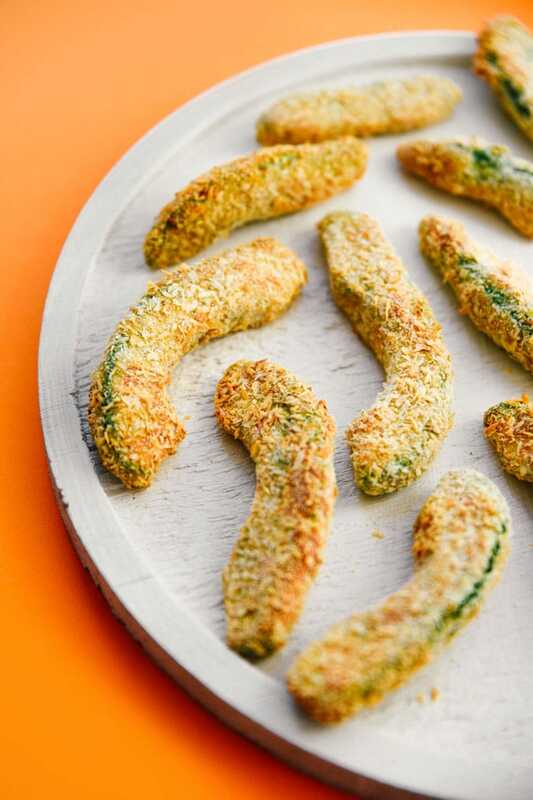 I’ve made avocado fries before and they were delicious! I never thought to do something like that for tacos. This looks delicious! I’ve never made the fries before, but after making these I can imagine they’re super tasty! These look amazing, and totally up my alley! I’ve never made crispy avocado before but it seems perfect!